We’d love your help. Let us know what’s wrong with this preview of CIN by Christina Leigh Pritchard. If that weren’t enough, she must leave sunny south Florida to attend a boarding school full of geniuses in cold, Lynn, Massachusetts. The city where the locals chant “Lynn, Lynn, Seventeen year old Lisa Brown’s life is falling apart. First, her mother and father divorce, then their house forecloses and now, her mother has decided to commit herself to a psychiatric hospital. To ask other readers questions about CIN, please sign up. "C I N" is the first book in Christina Leigh Pritchard's series introduces a little town called Lynn that has a very strange old saying. I found it very interesting to read about this town and do further research to find out some of the real life stories. I really appreciated author throwing in some little secrets about the town all throughout the book which made it very interesting. Lisa Brown is a seventeen year old girl who is trying to find herself while going through tough issues that most "C I N" is the first book in Christina Leigh Pritchard's series introduces a little town called Lynn that has a very strange old saying. I found it very interesting to read about this town and do further research to find out some of the real life stories. I really appreciated author throwing in some little secrets about the town all throughout the book which made it very interesting. From the very beginning of the book, Lisa seemed like a sweet girl who had some unresolved issues which would be understandable in her situation. However, the deeper I got into the story, I start to see how whiny her character was and it really made me dislike her. There is a moment in the book (trying to hold off the spoilers) where she could see the truth about Alex and how nice he was but she chose to be selfish enough to be blinded by rage which almost caused complications. "Bolts of lightning shot through my fingers and crashed into Alex. He flew across the lobby and crashed into the cafeteria doors. They fell off the hinges and glass littered the floor." Now tell me that's not going a little overboard and being psycho .. I just finished reading the first installment of Christina Leigh Pritchard’s “C I N” series: Book 1 - “Lynn, Lynn, City of Sin. You Never Come Out the Way You Went In.” And, I’ll tell you something interesting—after stepping into Pritchard’s fiction, I didn’t want to leave, and I definitely came out different than I went in. Pritchard’s work is a YA paranormal yarn, which typically isn’t found in my book bag. But I decided to give it a read nonetheless, to broaden my literary horizons—and I’m so very glad I did. This book may be YA, but it is for an ageless audience. The story is very compelling and intriguing, filled with characters—both human and animal—which touch your heart, slap you in the face, and raise your eyebrows. Full of surprises, the novel progresses at an addictively readable pace. I found myself going farther in the book than I had intended to go during each reading session. I just needed to find out more and more. It isn’t until nearly halfway through the work that Pritchard starts to reveal some of the characters’, and town’s, secrets. The build-up is riveting, and the revelations are shocking, sometimes disturbing, sometimes pacifying. The conclusion of Book 1 itself is not a conclusion, but rather an introduction. At the end of her work, Pritchard has her lead, Lisa Brown, asking herself many questions, which tease and taunt the reader with things to expect in the forthcoming books in the series. As soon as I read the last page, I found myself hitting one of Pritchard’s websites, http://cinseries.com, so that I could find more “C I N” to feed my new addiction. CIN is a great young adult paranormal story that has fresh concepts and ideas. The characters are unique and have their own personalities, which makes them seem like real flawed teens. It's easy to identify with Lisa because she's dealing with so many issues - the normal teen problems, trying to help her mentally ill mom, crushes on cute guys, going to a weird boarding school, etc. On top of these problems, she gets struck by lightning and begins a whole new life that she never even thought poss CIN is a great young adult paranormal story that has fresh concepts and ideas. The characters are unique and have their own personalities, which makes them seem like real flawed teens. It's easy to identify with Lisa because she's dealing with so many issues - the normal teen problems, trying to help her mentally ill mom, crushes on cute guys, going to a weird boarding school, etc. On top of these problems, she gets struck by lightning and begins a whole new life that she never even thought possible. She has to learn how to adjust to this new existence and just how she fits into her new life. I thought that the story was really interesting, but the dialogue of most of the characters didn't seem natural. That put me off a bit and pulled me out of the world the author was trying to create - I just kept noting in my mind that the dialogue and word usage felt scripted and forced. Otherwise, I enjoyed the story and it flowed well. There were some romantic parts in the book that I felt were cliched and pretty sappy, but it didn't hinder my reading or enjoyment of the story too much - it probably would appeal to most readers. I really love reading paranormal young adult books and I think that the author brought something new and different to the genre with this series. I'm excited to continue reading the series to see how things will go for the different characters and to see how things will turn out. C I N was definitely an unusual, yet entertaining read full of unexpected twists. Lisa, our main character, has been sent to stay with her aunt while her mother seeks help for her mental and emotional health. While staying with her aunt, she'll also be forced to attend C I N, an unusual boarding school for geniuses...even though she's of average intelligence as her aunt loves to remind her. Once she arrives at her aunt's home she encounters an eccentric cast of characters, both two and four-legged including siblings Alex and Ally, a dog named Pig and a cat named Rat. It's obvious to Lisa that this is going to be a big adjustment for her as she doesn't fit in her new environment. Things get even stranger when she's struck by lightning...twice! As Lisa gets used to her new temporary home, she discovers some family secrets and interesting facts about her new friends and the town of Lynn. Things that have a major impact on her and the world she knows. I am not sure what I was expecting when I started this book, but it definitely wasn't this fun, yet deeply emotional read. While the story is filled with humor and fun characters that I'd love to get to know, there is also a heavy and emotional underlying plot involving Lisa's parents that I wasn't expecting. I love Paranormal Romances and this one is perfect for Teens and Young Adults! Cynthia Leigh Pritchard is off to a great start with this first book of the CIN series. CIN is unique with a new approach and situations that would appeal to teens like cute guy crushes, an ill parent, moving, divorce and more. When the heroine gets sent to a boarding school, her life seems almost surreal and she has to adapt to all of this on her own. That’s where the real fun begins. “C I N: Lynn, Lynn, City of Sin. I love Paranormal Romances and this one is perfect for Teens and Young Adults! Cynthia Leigh Pritchard is off to a great start with this first book of the CIN series. CIN is unique with a new approach and situations that would appeal to teens like cute guy crushes, an ill parent, moving, divorce and more. When the heroine gets sent to a boarding school, her life seems almost surreal and she has to adapt to all of this on her own. That’s where the real fun begins. She’s told to ‘mind the cat’ named rat. People never age. And that’s just the tip of the iceberg. The story builds and builds with mystery and suspense for at least 2/3rds of the book. There is some romance and it gets a little more intimate than I would have liked (Remember, we try and post only Clean Reads) but it would likely appeal to most readers. This was a real page turner for sure. Once I started reading it, it was in my hands every spare minute of every day until I finished and then I wished there was more! Thank heavens it’s a series!! So if you are looking for something new and different, that’s a bit hard to describe, look no further than CIN! I was blessed enough to get this book from Christina Leigh Pritchard. I really enjoyed reading this paranormal romance revolving around a teenager named Lisa. She is forced to move to Lynn, Massachusetts and live with a aunt she has never met and room with people that are obnoxious and strangely beautiful, Lisa is thrown into a whole new life. Just when Lisa thinks things are falling into place for her, strange occurrences begin with the bazaar family she is living with. Ally, who hates Lisa for I was blessed enough to get this book from Christina Leigh Pritchard. I really enjoyed reading this paranormal romance revolving around a teenager named Lisa. She is forced to move to Lynn, Massachusetts and live with a aunt she has never met and room with people that are obnoxious and strangely beautiful, Lisa is thrown into a whole new life. I have to say, this was a pretty good book from a fairly unknown author. C.I.N. was well written with a story that I continued to keep my attention. Having no idea what to expect, when I first started reading this, I planned on setting it down after the first couple of chapters. But before I knew it, a couple hours passed and I was reading well into the night. The story kept moving and didn’t have hundreds of pages of useless fluff that many other books seem so fond of. I understand what the autho I have to say, this was a pretty good book from a fairly unknown author. C.I.N. was well written with a story that I continued to keep my attention. The story kept moving and didn’t have hundreds of pages of useless fluff that many other books seem so fond of. I understand what the author was doing and she pulled it off very well. Great book and I will be keeping an eye on this author for the rest of the series. Her parents divorced, her mom looses their home and Lisa is left standing at a train station heading to a town, boarding school and aunt she has never met. Lisa’s life has definitely taken some drastic turns and little does she know it’s only the beginning of her life changing experiences. CIN Boarding school is not quite what it seems, her Aunt Millie has secrets and so do the student at CIN Academy. C I N is a totally new paranormal concept with intriguing surprises that will have you guessing Her parents divorced, her mom looses their home and Lisa is left standing at a train station heading to a town, boarding school and aunt she has never met. Lisa’s life has definitely taken some drastic turns and little does she know it’s only the beginning of her life changing experiences. CIN Boarding school is not quite what it seems, her Aunt Millie has secrets and so do the student at CIN Academy. I obtained this book as a r2r. Words can't begin to describe this book. I started reading the book this morning after I recieved it from the author. I was instantly pulled in to the mythical world where people never age. I was quite surprised because usually it takes quite a while for book to pull me in. The characters were built up and slowly their secrets are stripped one by one. I loved this book to the end. It can continue in a second book or left the way it is. This book was beautifully writ I obtained this book as a r2r. Interesting premise. I don’t think I’ve ever read a story quite like this one. I enjoyed the character development as we learned more about each of the main characters. The idea that this group would go to all this trouble for a “normal” kid is amazing. The resiliency that Lisa shows is amazing. I’m not sure I could be as calm if it was happening to me, just saying. I give this book 4.5 out of 5 clouds. A really good read. If you like suspense stories, you'll love this book. When Lisa leaves Florida to visit her aunt in Lynn, she wasn't too keen on the idea. When she arrived, it was as if she was from a different world. The friends that she met were odd, the cat was bizarre and even the dog was strange. Throughout the story, you can't help but try to discern what is going on, but only toward the last few chapters are the clues given away. This is a story that'll keep you interested until the very end. Admittedly, I had a hard time getting into this book at first, but once I did, I was really intrigued by the story. CIN uses a great paranormal ability that hasn't really been covered, which was refreshing. The characters are quirky and likable and the plot sucked me in. Some places in the book were a little confusing, but in all I enjoyed this book and look forward to reading the sequel. Disclosure - I was given a free copy of this book in exchange for an honest review. This well written story kept my interest from beginning to end and the characters are all unique and jump right out of the pages. Lisa is my favorite character and little by little she realizes that things are often not as they seem. I look forward to reading the second book in this series!! What strange or quirky writing habits do you have? Christina: stood on a stage platform in a mall and dragged my foot making noises pretending to attack my cousin (on a dare). Christina: I haven’t found mine yet, but you never know! Dogs or cats or birds or rabbits or…? Are there any authors you would recommend to fans of your books, possibly that you love yourself? Christina: If you have children—read them Jerry Spinelli. You will laugh as much as them until your sides hurt. When writing a story, do you stop to consider how readers will react to certain plot twists and changes to relationships between characters and does it cause you to alter your story? Christina: I want them to be so busy reading that they forget about life for a few moments. Whether they figure out what’s happening is a bonus to me. Would you rather take a European vacation or a Caribbean cruise? Would you rather have no one show up for your wedding or your funeral? Christina: Visit the real Lynn, MA. Would you time travel to the future, or back to the past? Which would you choose: the ability to read minds or the ability to fly? Would you rather have a rewind button for your life, or a pause button? Christina: Pause to enjoy the great moments! Are you a country or city person? Do you play a musical instrument? If not, which would you like to learn to play? Christina: Never give up because some do not like what you create. Don’t take every comment to heart and enjoy those around you more. Work will always be there but not always the people you love. Christina: To make someone do something – I dislike manipulation. Christina: To fill my life with genuinely kind, loving people, find a husband with these qualities, and to remove suffering & torture from the world. Favorite meal at favorite restaurant? Christina: Don’t let the thoughts get inside your head. What internet site do you surf the most? Christina: Amazon :-) Guess what I am looking at! Christina: His Face—eyes, smile, persona. The way they look at me can make or break my attraction to him. For example, is it kind or intimidating? Then his arms and I am a sucker for a nice manly back. Christina: Right now, lots of waters for the hurricane. Christina: No frame, no things. Christina: Cinderella or Ariel. I’d love to live under the ocean and I’d love to find my prince and live in a castle. Would you rather swim in the ocean/lake or pool? What childish thing(s) do you still do as adult? Christina: I still will color and if no one is at the park when I go walking the trail, sometimes I get on the swing before heading home. You win a million dollars, but you have to give half to a charity. Which charity do you pick? What is something you own that has a lot of sentimental value, but little to no monetary value? Weirdest thing you've ever eaten. Thank you for taking your time to read about me. If you’re reading this, I consider it an honor. I wrote the C I N Series for anyone who just wants to escape life for a few hours. I hope the world of Lynn does this for you. I quite enjoyed CIN. I thought the story was unique, especially the lightning strike as the impetus for Lisa's powers. I liked following her development as she learned how to deal with her powers and a way of life that was completely out of the norm for her. All the while she had to deal with other issues, such as her mom’s illness, boarding school, moving to Lynn to live with her aunt and some downright disturbing teens, and her confusing love life. Lisa was a likable character that was real, flawed, and easy to root for. Everything a good protagonist ought to be. Secondary characters were also well-developed, some more than others, but overall all they were all nicely done—odd and creepy, they added nicely to the overall spooky setting of the book. I enjoyed Pritchard’s writing style. Although, I did find some dialogue and prose a little stiff and contrived at times. It felt too formal for a YA book. But it was easy enough to overlook and didn’t hinder my overall enjoyment of the story. The end of book one leaves the readers with a lot of questions, which I’m sure will be addressed in book two. But it also gives a lot of answers, too. Like the secrets of the creepy characters and town. Once readers finish book one, they’ll eagerly reach for book two in the series! And don’t worry if you’ve heard rumors about “beautiful characters” from other reviewers like I had… you aren’t going to meet any overly done vamps in CIN (I love vampires, but been there…done that)… you’re in for something much, much cooler! Alex stood, frozen in the center of the game room. I looked up at Michael and then back at Alex. Michael’s eyes were angry, and Reginald and his groupies stood against the wall with frightened looks upon their faces. Were they really afraid? I knew I was! His grip tightened and he forced me over to the pool table. I was drawn into this story right from the first chapter. Lisa's mum and dad have just gotten divorced, her house has been foreclosed, and her mum is checking herself into a mental hospital. So Lisa is being shipped off to live with her Aunt in Lynn, Massachusetts. I was engaged with the story.... right up until she arrived in Lynn. This is where the character development stops. Unfortunately, it felt like the characters were very two dimensional. They also seemed to do everything in extremes. One minute they are angry, the next they are friendly. They are immature and then mature. Honestly I can't say I liked much of anything about any of the characters. The pacing felt off, and there was a lack of flow with the story. The story was confusing, and then when things are explained, it just seems like a plot device to keep things interesting. What an amazing first book in this series and first time author for me. It’s a great YA and everyone else too. Eh, it was okay. I don't really understand all the four and five star reviews being put out. It wasn't that good to me. C I N is a wonderful beginning to the series. It’s an introduction into the life of Lisa Brown and the strange life that she begins with her Aunt Millie. This is a very fast paced read, easy flow with a great variety of characters. It is a very enjoyable young adult read and a mystery from the start. Lisa Brown is having it tough, first of all her parents separate, her mother is unstable and cannot hold down a job, so their house forecloses and they are forced to move. Lisa’s Mum is admitting her C I N is a wonderful beginning to the series. It’s an introduction into the life of Lisa Brown and the strange life that she begins with her Aunt Millie. This is a very fast paced read, easy flow with a great variety of characters. It is a very enjoyable young adult read and a mystery from the start. Lisa Brown is having it tough, first of all her parents separate, her mother is unstable and cannot hold down a job, so their house forecloses and they are forced to move. Lisa’s Mum is admitting herself into a psychiatric facility and Lisa is forced to stay with her Aunt Millie. She has never met this woman and has only ever spoken to her once. Lisa is anxious about the whole thing and she has right to be. Her Mother is eager to get Lisa on the train and out of her life, why can’t her Mother say “I LOVE YOU”? It would be really painful that your own mother couldn't say those three little words. What has happened to her mother? Lisa arrives at the train station and Aunty Millie is nowhere to be seen. A young boy is lounging around and starts yelling out her name. Aunty Millie had a meeting and sent Michael to collect Lisa from the train. This is the beginning of their friendship and the start of the strange behaviour of Lynne. There are 2 cottages near the lake with two kids living in one and while their parents are apparently away, Aunty Millie watches over them and she lives in the other. They have a cat, Rat and a dog, Pig. Rat and Pig are two of the strangest animals alive. They will not allow you to touch them and have personalities of their own. Rat eats at the kitchen table like a human. Right off the bat, these two kids are not likeable. Alex and Ally are the strangest kids she has ever known. They are hateful, paranoid and weird in their behaviours. Lisa cannot stand living with them and can’t wait for her mother to come back for her. Lisa is to start attending the school that Aunt Millie is headmistress of, C I N Boarding School. This is a special school for gifted teens with high intelligence levels. She is not looking forward to it at all. After a few days of enduring these horrible teenagers, her Mother does come back and they all go to lunch. Lisa was leaving with her Mother and not going to look back. Alex and Ally didn't want this to happen and they all went out into the street as they left. A huge lightning bolt struck the Lynne sign and a huge hole is in the road, trying to find a way around, Lisa and her Mother get out of the car, big mistake. Lisa looks up into the sky and BAM she is struck by not one, but two lightning bolts. Lisa wakes up in the hospital and feels amazing. She has never felt this alive, this energised or this healthy. What happened and why isn't she dead? How could she be struck by TWO lightning bolts? There is a massive secret that Ally and Alex are hiding and Lisa is the only one that doesn't know. What is this huge secret? Why do Alex and Ally speak as if they are centuries old, but are only teenagers? Where is Lisa’s Mother and why hasn't she come back for her daughter again? Where does Aunty Millie disappear to every night? Where are Alex and Ally’s parents, why don’t they return? Why is she starting to have feelings for Alex? There are so many questions that Lisa has and she is determined to find the answers. I loved the original story in this book and cannot wait to read book 2. And don’t you love the tag line? “Lynne, Lynne the city of sin, you never come out the way went in.” I didn't want to give away the secret so you can all read this fantastic book and find out for yourselves. The characters are fantastic, just like typical teenagers, annoying, self-absorbed and their moods changing every minute. The easy flow of the story and the lovable Lisa Brown will make the reader want to find out all of the answers for her. It is quite addictive and I recommend it to everyone who wants to read something different from the normal young adult paranormal books. I might've liked this book a lot less had I read it with a different frame of mind. Regardless, I was in mood for something crazy and C I N provided it to me. I did have a problem with Lisa's character though - her character was not well defined and completely unpredictable, and not necessarily in a good way. Her reactions to things were completely childlike and stupid at times while somehow she turned into a mature thinking person the next. I also couldn't digest the love triangle which in most I might've liked this book a lot less had I read it with a different frame of mind. Regardless, I was in mood for something crazy and C I N provided it to me. I did have a problem with Lisa's character though - her character was not well defined and completely unpredictable, and not necessarily in a good way. Her reactions to things were completely childlike and stupid at times while somehow she turned into a mature thinking person the next. I also couldn't digest the love triangle which in most ways wasn't really a love triangle at all. I didn't really understand the supernatural part of the book and how Alex's and everyone else's powers worked. The school or non-school the attitude of locals to the "students" there... I was thoroughly confused. Why everyone stopped her from touching Rat the cat also is hard for me to wrap my head around. The frequent moodswings for EVERY character also almost gave me a migraine. But I did say I liked this book, right? And yes - I actually did. Had I stopped to think about it and dissected this book I might've dwelled on the flaws and frustrated myself. But I went with the flow - finished the book in a single sitting and actually found myself enjoyed by the epic randomness and craziness of C I N. I read it as if it was a parody of every frustrating YA book that I have read and that made me enjoy this a hell lot more. First let me say that I was emailed a copy of C I N to review for the author, which gladly I excepted. 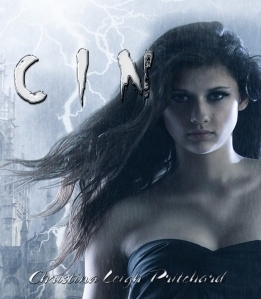 C I N by Christina Leigh Pritchard is a little hard for me to really untangle my thoughts for the review. The book is about a young girl who is sent away from her mother to live with her aunt in a very mysterious and eery situation. Lisa, the young heroine is the type of 17 yr old girl that doesn't exactly strike you as strong at first but after I have thought about it, I really do think she has First let me say that I was emailed a copy of C I N to review for the author, which gladly I excepted. C I N by Christina Leigh Pritchard is a little hard for me to really untangle my thoughts for the review. The book is about a young girl who is sent away from her mother to live with her aunt in a very mysterious and eery situation. Lisa, the young heroine is the type of 17 yr old girl that doesn't exactly strike you as strong at first but after I have thought about it, I really do think she has characteristics of a strong teen girl. Bravery and strength do not always have to come in a neatly packaged warrior for the characteristics to be there. Lisa does move even though she is uncertain of the place and people that surround her. She also is put in a strange scenario a few times and seems to stand up for herself a few times as well as manage to remain true to the type of person she was before. All of the characters have an endearing quality about them. Oh my goodness. This book. I cannot get enough of this book. All of the mysteries surrounding the characters, their backgrounds, their abilities, and their oddities drew me in from the very start. Knowing so little about these characters and being dragged back and forth trying to determine the truth about them might have become annoying if these characters weren’t so inherently charming. I found all of them to be appealing and loveable in their own ways, and I very much wanted to know more about Oh my goodness. This book. I cannot get enough of this book. All of the mysteries surrounding the characters, their backgrounds, their abilities, and their oddities drew me in from the very start. Knowing so little about these characters and being dragged back and forth trying to determine the truth about them might have become annoying if these characters weren’t so inherently charming. I found all of them to be appealing and loveable in their own ways, and I very much wanted to know more about them. In fact, as usual with stories I love, the only thing I can possibly say is that I want more! I want to know more about the histories of the other people at CIN. I want to know more about Lisa’s family. I want to know more about the enigma that she is and how her abilities may be different from the others. Chances are, I will be sticking with this series through the end. At first I didn't really understand why it took until halfway through the book until Lisa gets struck by lightening but it was a small thing that I got over very quickly. To be honest, once the author mentioned the witch trials, I was hooked completely, I don't know why but I always have been hooked with that bit of history. I loved the book, I just couldn't put it down, I am surprised at how quickly I was able to finish the book, considering how long it is usually taking me with all my universit At first I didn't really understand why it took until halfway through the book until Lisa gets struck by lightening but it was a small thing that I got over very quickly. I loved the book, I just couldn't put it down, I am surprised at how quickly I was able to finish the book, considering how long it is usually taking me with all my university work. The book was well written, I loved the characters, however I didn't really understand the aunt, I'm hoping that will be something that the author will resolve in later books. Overall, this series looks like one I could really enjoy and I cannot wait for the next book. This review has been hidden because it contains spoilers. To view it, click here. Sorry for the review being late. I have been dealing with a sick baby and havent been on Goodreads for a couple days. My apologies. I want to say is that I really loved it. I cant wait to see what happens. I felt that although Alex and Ally felt like they were doing the right thing, they really werent. There was a moment where I really didnt like them but then they grew on me after some things were revealed. I think that although things are different in this city, everyone still has a young perso Sorry for the review being late. I have been dealing with a sick baby and havent been on Goodreads for a couple days. My apologies. If you want an entertaining YA sci fi? Then this is for you. As the blurb says, its about the life of Lisa Brown, her parents’ divorce, her transfer to Lynn, Massachusetts to live with her Aunt Millie. There she met weirdness to the highest levrl, not to mention rudeness and tactless. You cannot imagine someone just like that. The storyline is very extraordinary which you may a little bit confusing until Alex explained everything. The characters and story are very unique. It makes me want to turn If you want an entertaining YA sci fi? Then this is for you. The characters and story are very unique. It makes me want to turn the pages til the end. And ofcourse, makes me want to read the second book immediately. Once I got this r2r, I started reading it because my sister explained how AMAZING it was to me. I completely fell under the CIN spell and kept reading, even during school in class! I just couldn't tear my eyes away from my phone for even one second! I meant to do this review a few days ago but my headache kept getting worse. The characters were welly developed and all the secrets were kept quiet till the end of the book, which made me really want to keep reading. I love the way the book is writte Once I got this r2r, I started reading it because my sister explained how AMAZING it was to me. I completely fell under the CIN spell and kept reading, even during school in class! I just couldn't tear my eyes away from my phone for even one second! I meant to do this review a few days ago but my headache kept getting worse. This book puts a whole new spin on paranormal! Fast paced and exciting, I couldn't stop reading. The paranormal happenings are unlike anything I have read before and make the mysteries even harder to figure out. I am eagerly awaiting the next book in the series!